PRODUCT DESCRIPTION: Ages 4+ Press trigger for fart sound effects and color changing lights. 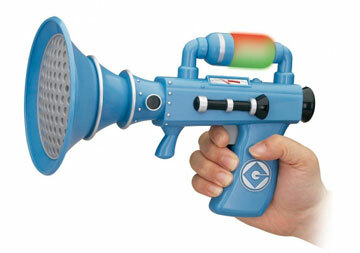 The Despicable Me Fart Blaster includes Joke Mode with 20 second time delay fart sound. CHOKING HAZARD - Small parts. Not for children under 3 yrs. I know it's there for liability and legal what-have-you, but seriously, the "choking hazard" has to be some kind of raunchy flatulent by-product joke. Isn't that the point of a fart gun? Someone, somewhere, during the creation of this toy, had to have the same childish hilarity as me and caught this. In my heart I know someone giggled at it and that simple fact brings me great joy. Labels: humor, movies, toys, WTF?